Cooking is an art and not only does it take a good recipe to come up with food that tastes great but techniques, time, utensils used, and appliances play a major role that helps decide the fate of the final outcome. It’s important that all the components mix up well together to form a flavor that will be felt with the first bite. A hand mixer is just one of those appliances which will help you mix ingredients at your desired speed and finish with a texture exactly needed for the recipe, especially when it comes to preparing mixes for pancakes, sponge cakes or other baked goods. With heaps of options available online and in stores, it can be quite challenging to choose the perfect hand mixer. But there’s no need to worry as we’ve prepared best hand mixers consumer reports to help you choose the one you’ll reach out for every day. 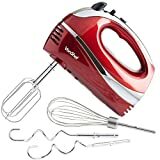 If you love to bake cakes but hate a messy counter then go for the Hamilton-beach 62682RZ hand-mixer as it will do the whisking, mixing and folding for you without the need of any spatulas or other mixing spoons that will probably slow down the process and create air bubbles in the batter. It’s equipped with a powerful 250 watts motor and has six-speed choices with a burst function to add extra power to any speed level. It also has a built-in bowl rest so you needn’t worry about drips during breaks. After use, let it rest on the snap-on storage box which also holds the attachments and cord. If you’ve always wondered how professional chefs always end up with perfect tasting food then the KitchenAid-khm7210cu-digital hand-mixer is that hidden secret to look out for. It has 7 speeds that perform different tasks such as speed one to mix a hard dough, speed four for mashing and speed seven for beating egg whites to foam and whipping. Use the soft start feature to slowly increase beater speed preventing splatter and bubbles. Fix the cord on either side to work without moving much. Releasing attachments is as easy as 123 with the touch of a button. For the master chef in you, the Cuisinart-HM-90S Power-Advantage Plus is your kitchen companion with 9-speed options to choose from and a powerful 220 watts motor. It also supports a smooth start function with the first three speeds to avoid splattering and gradually rises to the fastest mode. Baking homemade bread and perfectly whisked eggs for that cake were never this easy. The hand mixer also comes with additional attachments such as chefs whisk, dough hooks, spatula, and a recipe book. It is easy to clean and dishwasher safe. With a 250 watts motor and 6-speed options the BLACK+DECKER-6-Speed Hand-Mixer makes it easy to handle a variety of kitchen tasks. 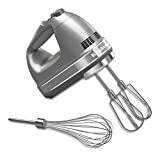 The mixer comes with wire beaters, 2 dough hooks, and a whisk. Take a slow start and increase according to your needs. For harder ingredients, there’s a turbo button that boosts the mixer speed to maximum so can beat, whisk and mix without hassle. It comes with its very own storage case and is dishwasher safe. If you have a likeness for stylish kitchen appliances then the VonShef-Electric Hand-Mixer will leave quite an impression. 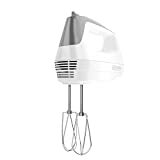 The hand mixer not only looks good but is equipped with a 250-watts motor as well as additional stainless-steel attachments such as 2 dough-hooks, and a whisk for supported aid to bake, stir, whisk, mix and whip soft to heavy ingredients. Go through 5-speed options starting from slow to top speed, plus a turbo function, if you need more power. Release the attachments with a touch of a button and wash easily in the dishwasher. It comes in 4 glossy colors and will surely have the guests asking where’d you get it from? It looks professional and works exactly like one. 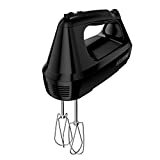 The black+decker-lightweight hand-mixer is designed to meet all your whisking, mixing and whipping needs. So no matter if you’re preparing cake batter, dough for cookies or bread or sauces to go with the main course, this powerful hand mixer has it all covered. It supports 5-speed options and additional power boost function for faster work. When you have a good helping hand in the kitchen, cooking also becomes easier and fun. The Cuisinart-HM-90BCS Power –dvantage-Plus 9-Speed Handheld-Mixer is that helping hand with a 220 watts power motor, easy one-touch speed control with 9- speed options to choose from. Choose from 3 low start speeds and make your way to the fast mode. It comes with extras such as chef’s whisk, dough hooks, spatula, and users manual with recipes to try. Also, it is easy to clean and can be stored in the snap-on clear storage case that also holds additional parts. Breville came up with this masterpiece by combining technology with technique. The Breville-BHM800SIL Handy-Mix Scraper Hand-Mixer is an intelligent machine that, with the help of IQ intuitive interface identifies the attachment used and adjusts speed in accordance with the ingredient being used. The powerful 240 watts motor ensures low sound and high performance. The scraper beaters reach to all corners of the bowl for proper mixing and the mixing light lets you take a peek at the ingredients and helps decide whether you’d want to work it further. It supports 9-speed options for optimal mixing. It takes a durable machine to mix and produce batters and dough that feels just right and the KitchenAid-KHM512OB 5-Speed Hand-Mixer does just that by making it easy to mix hard ingredients such as nuts, chocolate chips or even heavy cream. Choose from 5-speed options with number one being the lowest and moving on the highest speed at number 5. Set the flexible cord on either side to work comfortably without moving around and release attachments by pressing the eject button. 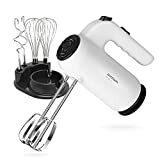 Equipped with a boost of 300 watts power motor and 5 speeds to vary between cooking styles, the Hand Mixer-Electric SHARDOR 300W-Power and Slower-Start-Mixer is a multi-tasker appliance with a storage base for the mixer and attachments. 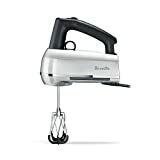 Prepare your desirable mixes with the help of additional attachments which include two dough hooks and two whisks. The carefully designed structure makes it easy to hold onto and release attachments with a simple button. Make sure the mixer has a wide base so it can stand on the countertop. A narrow base can make the mixer toggle on the counter and it may end up falling and breaking apart. A hand mixer should not be very heavy as it can get uncomfortable with prolonged use and the end user may feel tired quickly, which will eventually affect the mix being prepared and it may not taste as expected afterward. Be sure to test the slow speed first as starting off a fast speed may end up splattering the batter all over. Hand mixers with many speed options often have faster speed levels at number 2 and 3 so it is better to start off with number one at all times. Choose a hand mixer that meets your cooking needs. If you don’t need extra attachments then go for a basic model which should cost relevantly low as compared to ones with extra attachments. Also, some mixers offer the same functionality as that of a regular mixer but only have a better exterior which can cost a few extra bucks. To choose the best hand mixer it is important to recognize the kind of need you have for it. With technology taking over every industry these days, hand mixers are being integrated with new features which cause the prices to go a bit high. But if you have a flair for good cooking then you shouldn’t worry about the price point as a quality hand mixer will support your cooking for years to come.